Six decades and millions of adventurous miles in the making, the 2020 Toyota Land Cruiser Heritage Edition melds exclusive design with added function for its debut just ahead of the Chicago Auto Show, where it will be shown to the public for the first time. The Land Cruiser Heritage Edition honors this legendary vehicle's continuous evolution, from bare-bones, mountain-climbing 4x4 to world-renowned, full-capability premium-luxury utility vehicle. The Heritage Edition also celebrates the Land Cruiser's continuous place in Toyota's U.S. lineup since 1958. For the 2020 model year there will be 1,200 Heritage Editions available, with units going on in late summer of 2019. Pricing will be announced closer to on-sale date. The 2020 Land Cruiser Heritage Edition, only offered as a two-row model to maximize cargo capacity, is dressed elegantly for the occasion. The choice of Midnight Black Metallic or Blizzard Pearl exterior color is uniquely styled with a black-accented grille and bronze-colored BBS 18 x 8.0-inch forged aluminum wheels featuring a "TOYOTA" center cap. A vintage-style Land Cruiser exterior badge evokes the vehicle's long, accomplished history in an understated way. Highlighting the Land Cruiser's renown for blending luxury with capability, the Heritage Edition is exclusively outfitted with black leather-trimmed upholstery. The bronze wheel color carries inside for the contrast stitching used throughout the cabin, including the steering wheel, door trim, center stack, console and seats. Finally, the Land Cruiser Heritage Edition features all-weather floor mats and cargo liner, so it's ready to get out and have fun. 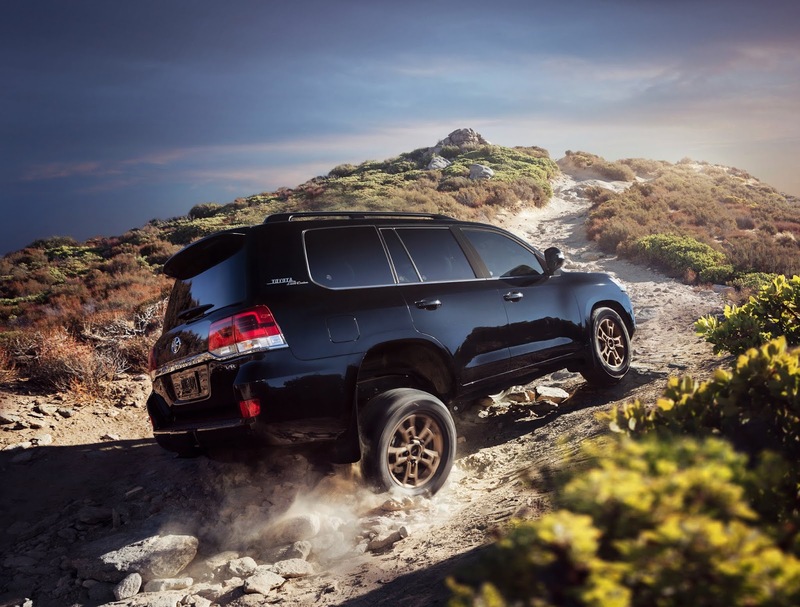 Land Cruiser's off-road capability is rooted in high-strength body-on-frame construction and sophisticated double-wishbone front and four-link coil-spring rear suspension. Kinetic Dynamic Suspension System (KDSS) hydraulically adjusts the stabilizer bars to enhance on-road smoothness and off-road wheel articulation. Off-road prowess is supported by a plethora of advanced assist technologies, including Downhill Assist Control, Hill Start Assist, CRAWL Control, and Off-Road Turn Assist. Using the Multi-Terrain Select system, the driver can match wheel slip control to the surface and driving conditions. The 2020 Heritage Edition features Land Cruiser's full complement of amenities, including ventilated front seats, heated steering wheel with power tilt and telescoping and memory, power moonroof, four-zone automatic climate control with 28 cabin air vents, and Smart Key keyless entry with push-button start. For additional storage options, the Heritage Edition removes the cool box in the center console of the front seat. A 9-inch touchscreen infotainment system features standard Premium JBL® Audio with Integrated Navigation, 14 JBL speakers, split-screen capability, advanced voice recognition, Siri® Eyes Free mode, SiriusXM® Satellite Radio, Bluetooth®connectivity and music streaming, and Qi wireless phone charging with compatible phones. Toyota Safety Connect (with three years of complimentary service) uses onboard cellular technology, independent of the driver's phone, to provide such services as Automatic Collision Notification, Stolen Vehicle Location, Emergency Assistance Button (SOS), and GPS-enhanced Roadside Assistance. The Land Cruiser traces its origins to the 1951 BJ, Toyota's bid to produce a small 4WD military vehicle. It was not chosen but went on to become the first motor vehicle to reach the sixth station on the trail to the top of Mt. Fuji. The BJ became the Land Cruiser in 1954, and an updated model, the 20-Series, was one of the first Toyota exports to the United States in 1958. The next Land Cruiser iteration, the 40-Series (a.k.a. FJ-40), arrived in 1960 and became an all-terrain icon (and now a collector's item). A larger station wagon model followed in the late-1960s, putting the Land Cruiser on a path toward family adventures. By 1991, the 80-Series Land Cruiser was well on its way to becoming a full premium model. The 100-Series codified that direction in the late-1990s with a V8 engine and full array of advanced chassis systems and luxury amenities. The current Land Cruiser, known internally as the 200-Series, is the most advanced and luxurious in the model's history.